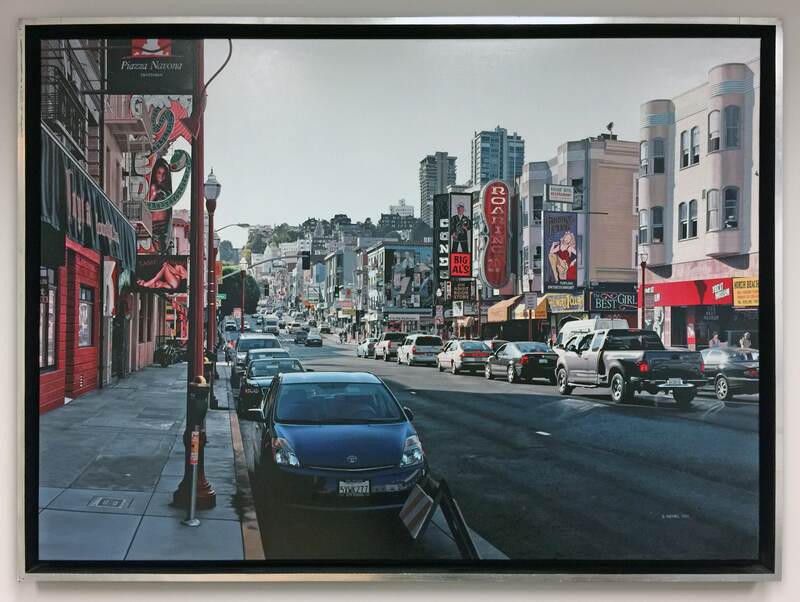 Bertrand Meniel is a Photorealist painter whose urban compositions are expertly expressed. Meniel’s works are reflective, refined, and rich in pigment. From the leaves on the trees down to the cracks in the street, the artist captures the details and nuances in urban scenes that allow for his paintings to come alive. Some of his works are created from panoramic views, while others are more traditional landscapes. Meniel memorializes some of the great cityscapes of our time. Bertrand Meniel’s path to painting has been unorthodox. Born in Boulogne Billancourt, France, in 1961, Meniel studied physiotherapy in college. He had always had an interest in art, but it was not until the late 80s that he decided to commit to being an artist full-time. He would not regret his decision. As he practiced, he found he could paint images uncannily similar to their photographic originals, with a degree of precision almost unparalleled in the world. His literally wide vision and technical skill did not go unnoticed, and in 1997-98, he participated in the “New Photorealists” show at the Louis K. Meisel Gallery in New York. The young artist quickly became a leader in the new ‘third generation’ of the Photorealist movement, a group of painters including Clive Head and Linda Bacon whose “work in the nineteen nineties has singled them out as…the ones who will maintain and advance the movement well into the twenty-first [century].” Meniel went on to have solo shows at the gallery in 1999, 2002, and 2011. Meniel still works out of the south of France, but he has painted primarily from images of urban landscapes in America and elsewhere. Of course, his success in the U.S. is not due to his subject matter alone: Meniel has taken photorealism to the next critical level. He has developed a distinctively photo-real painterly style. His cityscapes are so photographically detailed that they often fool people into thinking they are looking at photos—only to give them pause, and make them think about what it means to re-mediate and reconstruct an already captured image in paint, or to be fooled by an image, especially today when our ideas of the world are constructed through photographs rather than what we see with our own eyes. “We often fail to really see a familiar environment. We assume it lacks beauty or mystery because we have a practical relationship with it. 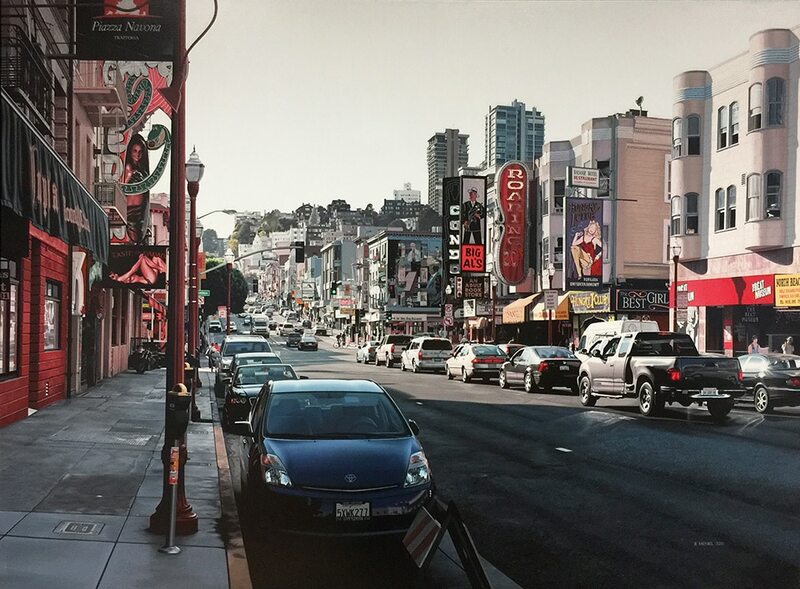 A Photorealist painting teaches us to consider objects differently. Objects that our daily routine deprives of purpose or importance acquire dignity and relevance through artistic representation. Whereas a camera often captures objects by chance. the painter places objects on his canvas intentionally, devoting hours of work to their representation. We may only glance at a photograph, whereas we typically peruse a painting because the elements that compose it are symbols of our civilization. 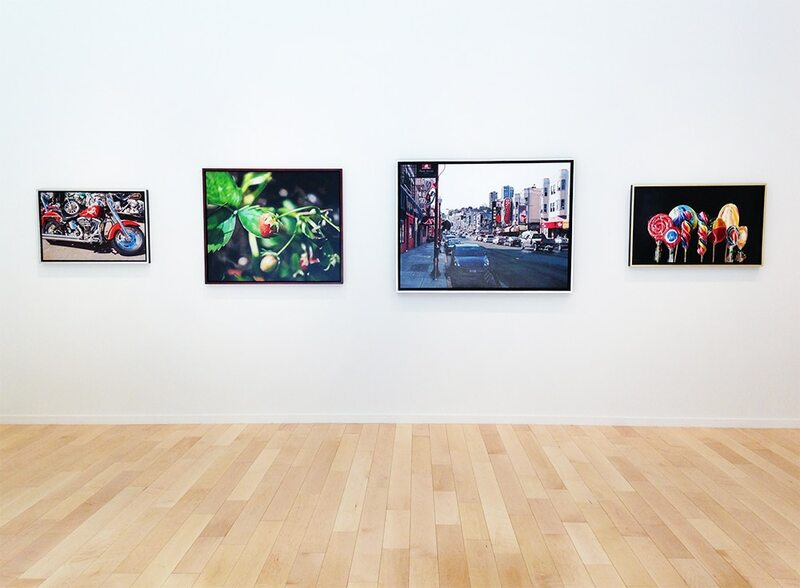 The fascination with Photorealist representation of everyday objects does not only owe to technical ability, but also to the often overlooked beauty that these paintings allow the viewer to experience. The artist trains the viewer’s eye and drives her or him to see the world as never seen before. The aesthetic pleasure that arises from the relationship between lines, surfaces, and colors is an intellectual experience that springs from both recognition and cognition: recognition because the painting brings back memories of prior experience, and cognition because it completes that experience by revealing elements that the viewer did not see. The camera is an optical instrument that records lines and colors but does not infuse anything into them. It is a passive witness: it catches appearances but it does not see. As a Photorealist painter, I free myself from photography by modifying dozens of different photographs. enhancing and combining them if necessary before drawing them on canvas. The creative process begins with taking photos but requires interpreting the photographic images into a work of art. The painting process frequently invovlves changes that increase the coherence of the finished work. For me, every element of the scene being painted has the same importance. I tend to make the whole picture readable, each object recognizable, each attitude intelligible. Consequently, the viewer can run her or his eye over canvas, ponder any or all of its details, and develop a relationship with the painting different from that of any other viewer. I offer no opinion on what I represent. I simply say that it exists and it deserves to be looked at.